It was an amazing week in Ermelo/NL. Senta and L’Arbuste represented the german flag at the worldchampionships of young dressagehorses in the 7 year old division. In the first test on thursday, the beautiful combination could finish 5th with 78,267%, eventhough an expensive mistake happened in the right canter Pirouette. This meant the ticket to the finals on saturday afternoon. Also on saturday “Mini” could show what a special horse he is. Unforfunately he was quite tense in the beginning of the test due to the exstatic atmosphere in the full stadion was a Little overwhelming and “Mini” spooked once. The combination had to ride an unplanned circle, which caused a minus of 0,5% from the final result. Still “Mini” started to feel more and more comfortable in the arena and they could shine with highlights in the test. 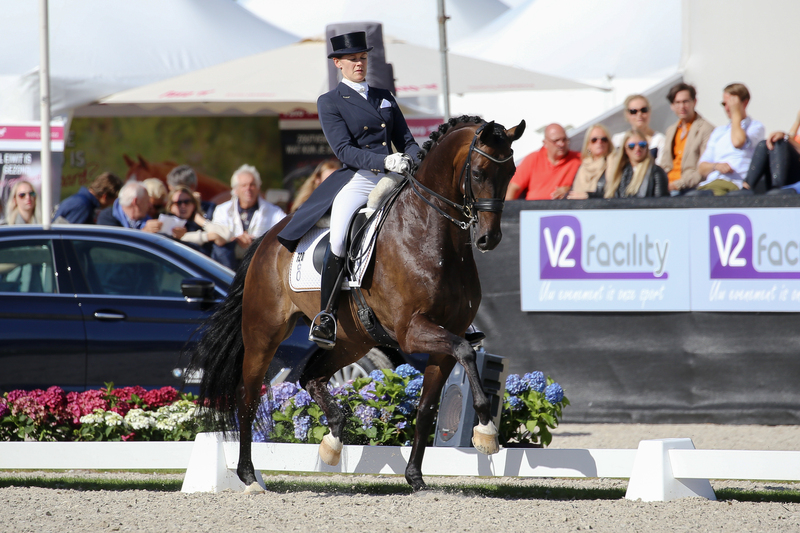 79,674% showed on the board at the end, with high marks for L’Arbustes quality and a 9,0 for the perspective as a dressage horse – 6th place. We are super happy and proud!! We believe for this horse only the sky is the limit! Thank you Mini and thank you to the whole Team Gut Bertingloh!! !